The last time the women’s basketball team took the court in Berkeley, California, freshman Sabrina Ionescu hit a half-court buzzer beater to give the Ducks a huge Pac-12 win. That was 2017. Fast forward to February 8, 2019. And while the result was the same, the circumstances of this Duck win were vastly different. Oregon came into this game with the tall task of not looking ahead to its game on Sunday against No. 11 Stanford. The formidable warmup opponent was the University of California. The Golden Bears (14-8, 5-6) feature one of the Pac-12’s best players: Kristine Anigwe, who averages 22 points and 16 rebounds a game. Those 16 rebounds are more than what Ruthy Hebard and Satou Sabally average -- combined. 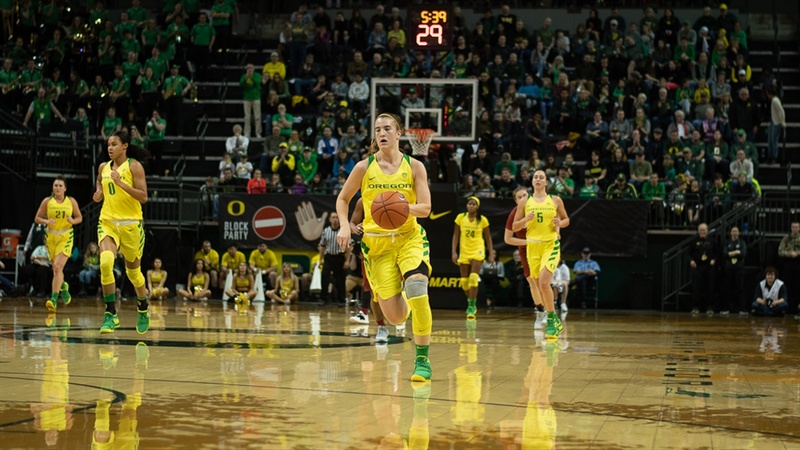 Oregon started Friday’s game on a 14-1 run, paceed by Ionescu, but the game changed quickly as Hebard went to the bench for the half with two quick fouls. At the turn of the second quarter, Cal went on a 10-2 run to cut into and ultimately take the lead away from the Ducks. Oregon finished the second quarter strong, going on a 10-2 run of its own to take an 8-point lead into the break. The second half was all Ducks. Oregon used its perimeter shooting to pull away, and it went into the third quarter with a 17-point lead. From there, Oregon really stomped on the gas. The Ducks exploded for 34 fourth-quarter points and an easy win. What got the Ducks the win? Let's take a look in the latest edition of Good, Bad and Ugly. Leading off the Good section is the hometown hero, Ionescu. Ionescu finished with 27 points, 5 rebounds and 4 assists on 10-15 shooting, including 3-4 from beyond the arc. Ionescu, who hails from nearby Walnut Creek, must have had this game circled for months. With more than 100 friends and family at the game, she scored 13 points in the first quarter to put her stamp on the game. She slowed a bit after that, but she was still able to make key plays. In particular, Sabrina did a really good job rotating into the paint to help Oregon's bigs protect the rim from Cal superstar Anigwe. Ionescu would lurk just outside of the key, then rush to either the shooter or Anigwe down low. Anigwe finished with 23 points, but most of those came in the second half after the game was mostly out of hand. Ionescu played her heart out today, and it was a great effort in front of her friends and family. What if I told you the best player on the Ducks was Satou Sabally? I’m not ready to give her the title yet, but with every game she looks like she can be right there. In Berkeley, Sabally finished with 31 points on 10-15 shooting, including 6-8 from three. That’s not all! Sabally recorded 9 rebounds, 3 assists and 5 steals. Sabally’s combination of size and skill is really hard to find at any level of women’s basketball. She's 6-4 and can dominate off the dribble, shoot threes or play point guard. Everytime she steps on the court, she has a chance to dominate. One of the most overlooked players on this team is Maite Cazorla. All Cazorla did today was rack up 17 points and 9 assists on 6-8 shooting. Cazorla is one of the most consistent players on this ball club. When Cal went on their two runs in the first half, Cazorla was able to hit a layup, make a jumper or find a cutting Duck in order to stop the charge. Cazorla plays with complete control over herself and the game itself. She can always be relied on in the clutch. As far as individual performances go, the three listed above were as good as it gets. As a team, this was a great effort to exploit Cal’s lack of defense. Cal struggles on the defensive end; it allows opponents to make three-pointers at a high clip. What did Oregon do about it? The Ducks shot 61 percent from beyond the arc (14-23), including 11-15 in the second half. Most of the Ducks' threes were wide open, and credit them for just routinely stepping into their shots and knocking them down. Some other key team stats: Oregon shot 60 percent overall on the game, including making 46 points in the paint -- with few of those from Hebard. Oregon forced 12 turnovers and converted those into 17 points, while only turning the ball over 5 times. Another positive that I have been clamoring about for weeks is that Oregon shot 88 percent from the charity stripe, which is where it should be every game. Oregon’s perimeter defense was a little lackluster, allowing 13 threes on 28 attempts, a 46 percent conversion rate. That was in large part due to the concentration on Anigwe, but there has to be more motivation to close out on shooters. The Ducks also allowed 13 offensive rebounds -- once again due in large part to Anigwe’s dominance on the glass. She averages 16 rebounds a game, but 13 offensive rebounds is just too many to yield. Cal grabbed 34 rebounds to Oregon’s 29. I could have put the offensive rebound stat in the ugly category -- that’s how much I value rebounding -- but I decided against it. Oregon’s offense kept any thought of an ugly entry out of my mind. Oregon has its biggest conference game of the season on Sunday against No. 11 Stanford, in Palo Alto, televised on ESPN2 at 1 p.m. I’m excited as can be for this game, as Stanford holds a 22-game home winning streak. Sitting two games behind Oregon with five to play, the Cardinal simply must knock off the Ducks if it wants to win the regular season Pac-12 title.